April marks the return of the cherry blossoms to Washington DC. 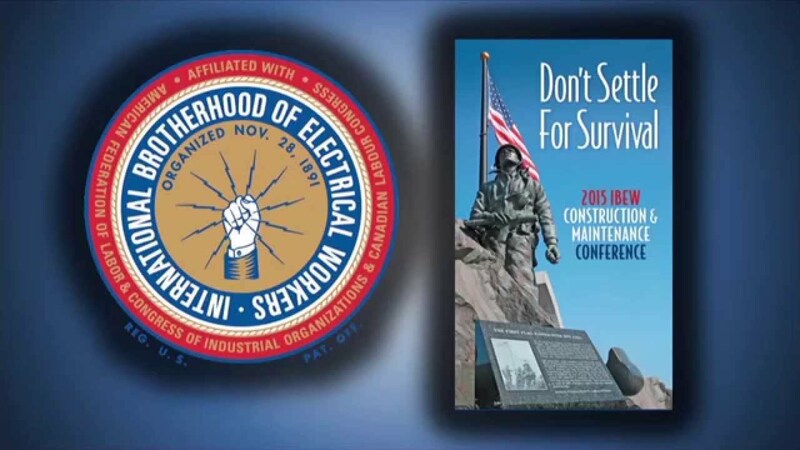 April also marks the return of the annual International Brotherhood of Electrical Workers (IBEW) Construction and Maintenance Conference. For three days, IBEW brothers and sisters from all over North America gathered to discuss and learn how they all have a role in making the IBEW bigger and better. IBEW International President Ed Hill’s speech recognizing everyone’s efforts to increase IBEW’s market share and a reminder of all the International Office (IO) programs available to locals. NECA’s District 10 Vice President Tom Halpin shared the contractor’s view of today’s line work. Jason Iannelli of the Electrical Training Alliance provided an update on their always-evolving curriculum. IBEW Local 17’s Business Manager Dean Bradley showed off their innovative Line Clearing Training and Marketing Program. The Leadership Workshop stressed networking between business managers to share best practices. The Business Development Workshop identified the type and location of current and future work. IBEW International President Ed Hill’s keynote speech praising the current increase in work but tempering that excitement with the challenge for everyone to not settle but to continue to strive for more. Congressman Donald Norcross of New Jersey spoke on what the IBEW means to him and shared how he went from an electrician to a member of Congress. Italy’s Carlo De Masi the Secretary General of the International Federation of Electrical Utility Workers shared an international perspective of the issues facing organized labor. Bill Hite, General President of the UA raised the concern of foreign workers being brought to the US taking these jobs away from American workers. Presentation of the Hour Power Awards recognizing the Apprentice, Journeyman, and Instructor of the year. The Electrical Training Alliance discussion on code and safety updates as well as an overview of their new training model. O.A.R.S. Reloaded covered all the new features of the new Organization Accountability Reporting system. The Canadian Caucus covered issues unique to the IBEW north of the border with a focus on politics. A significant amount was covered in a short time at this year’s Construction and Maintenance Conference. With the conference in the books, now it is time to put these principles in action in order to fulfill the mission of “Don’t Settle for Survival”. Hello. I’m Matthew Walton. Welcome to this expanded edition of news briefs. You know our nation’s capitol isn’t the only thing that’s undergoing work here in Washington so is the IBEW. Joining me today to talk about it is the newest member of the Hour Power-Electric TV team, Erica McClaugherty. Thanks Matthew. Great to come on board. You’re right. Work is always being done to make the IBEW bigger and better, and part of that strategy happens right here, every year at the annual Construction and Maintenance conference. Following Jerry Westerholm’s promotion, newly installed Director of Construction and Maintenance Jim Ross introduced President Ed Hill, he fulfilled his annual tradition of speaking briefly at the pre-conference outside line and tree trimming meeting. President Hill had high praise for the work of the outside branch, for aggressively going after more work, and raising market share as a result. He did stress the many I.O. programs that are available to all local areas, and urged local leaders to use them more often to keep the market share arrow pointing up. NECA’s District Ten V.P. Tom Halpin spent some time talking about the contractor’s view of today’s line work. He shared President Hill’s view that even though outside line work is up, we cannot be satisfied noting that customers are more demanding than ever, Halpin said that places more pressure than ever before on the partnership between NECA and the IBEW to raise the bar not only in productivity, but also when it comes to supplying the sheer numbers of linemen that will be needed for tomorrow’s workforce. Jason Iannelli of the Electrical Training Alliance provided an update on our always – evolving curriculum. Among the latest news items, new textbooks on rigging and cable splicing…and the progress being made on providing crane certification for IBEW linemen. Local 17 continues to lead the way with line clearance training programs. In a line of work that is certainly not for everyone, business manager Dean Bradley showed off the latest promotional materials. He used to explain their three-stage approach to training the best the industry has to offer. The preconference workshops were all about leadership and business development. The leadership workshop had people go back to the basics to talk about simple techniques you can apply right away at your local union. Tim Speno, President and CEO, E2E Summit THAT CALL TO ACTION WAS TO NETWORK WITH OTHER BUSINESS MANAGERS AND BUSINESS AGENTS AND TRAINING DIRECTORS AND OTHER LOCALS BUT MORE IMPORTANTLY NETWORK WITH PEOPLE THAT THEY DON’T KNOW TO LOOK AT BEST PRACTICES AND TO UNDERSTAND AND TALK ABOUT THE BEST PRACTICES THAT THEIR DOING SO THAT THEY COULD IMPLEMENT AT HOME. The business development workshop provided excellent information on where the construction work is and how to succeed in face-to-face conversation…. But the most important message? When all the conference delegates got under the same roof for Friday’s general session, it became clear why “Don’t Settle for Survival” was chosen as this year’s theme. President Hill in his usual form addressed the conference delegates in his keynote speech. He said much of North America work is up, but just being happy with what we have”is not a mantra accepted by senior IBEW leadership. Ed Hill, International President, IBEW WE CANNOT CONTINUE TO USE THE SAME TOOLS WE TRIED TO USE 30 YEARS AGO, OUR INDUSTRY IS DIFFERENT. IT’S 100%, 180 DEGREES DIFFERENT FROM WHERE IT WAS. YEAH IT’S ALL ELECTRICITY. THE WAY IT IS BEING DONE. IT’S EASY TO PUT ON A BANDAGE HERE AND STOP THE BLEEDING PUT ANOTHER ONE HERE. BUT IT REALLY NOT WORKING ALL WE ARE DOING IS SLOWING THE PROCESS OF THE LOSS OF LIFE BUD OF THIS UNION. AND THAT’S MARKET SHARE. WE WELCOME THE CW/CES AND MAKE THEM PART OF US. WE MUST DRAMATICALLY INCREASE THE NUMBER OF APPRENTICES TO FILL THOSE HUGE NUMBERS OF THOSE WHO WILL BE RETIRING IN THE NEAR FUTURE. WE MUST BE BOLD BROTHERS AND SISTERS, YOU MUST LEAD. SO BROTHERS AND SISTERS I’M ENCOURAGED. WE ARE THE EDGE OF THE FUTURE IN THIS BROTHERHOOD AND I WANT ALL OF YOU TO TAKE RESPONSIBILITY FOR THE SUCCESS OF THE IBEW AS WE MOVE FORWARD. I KNOW IT CAN BE DONE. THE FUTURE OF THE IBEW IS IN YOUR HANDS, NOT JUST IN HANDS OF THE PRESIDENTS, OR INTERNATIONAL SECRETARY OR VICE PRESIDENT, EXECUTIVE COUNCIL AND OTHERS… IT’S IN YOUR HANDS! He spoke about the nationwide trend of increased construction activity and said there is no better time to seize the moment. Ed Hill, International President, IBEW WHEN THE SECOND LARGEST PHARMACEUTICAL COMPANY IN THE WORLD ANNOUNCED BUILDING A DATA CENTER TO STORE VAST HOLDINGS OF RECORDS, GLASGOW SMITH KLEIN. THEY TURNED TO THE PROMISE OF A CODE OF EXCELLENCE ON THEIR PROPERTY. THAT COMPANY HAD THEIR PICK FOR A 30 MILLION DOLLAR JOB. WHEN THEY SAW A PRESENTATION FROM THE LOCAL UNION ON THE ADVANTAGES OF COE BY THE IBEW THE JOB WENT TO US! MOST RECENTLY THE COE IS FEATURED IN THE WITH OIL AND GAS, AS ENERGY PRODUCTION RAMPS ITSELF UP, YA KNOW WORKING UNDER THE CODE OF EXCELLENCE LOCAL 361 INCREASES ITS MEMBERSHIP BY 30% SINCE JAN 2014. THE FUTURE RELIES ON HOW THEY REACT EVERY DAY ON THE JOB WITH THE CUSTOMER SO THE CUSTOMER KNOWS THEY HAVE A QUALITY PRODUCT WITH THE IBEW. Congressman Donald Norcross from New Jersey spoke about what the IBEW has done for him… how he started as an electrician and made his way up to being a Congressman. Donald Norcross Congressman, New Jersey First District I WANTED TO BE THE FIRST BUSINESS AGENT SWORN INTO CONGRESS SO WE MADE THE ARRANGEMENTS AND ETHICS SO WHEN I PUT MY HAND ON THAT BIBLE AND SWORE IN I WAS THE ONLY BUSINESS AGENT IN THE UNITED STATES CONGRESS FROM THE IBEW. MY FIRST SPEECH ON THE FLOOR IN THE HOUSE I TALKED ABOUT HOW I GOT THERE MY UNION BROTHERS AND SISTERS AND HOW PROUD I WAS AND IT’S NOT JUST ME STANDING HERE IT’S EVERYONE WHO CAME BEFORE ME AND WILL COME AFTER ME. WE ARE ALL TOGETHER ON THIS . MY EARLY DAYS WORKING AT A MOBILE REFINERY IN THE MANHOLES THE LAST PLACE I THOUGHT I WOULD EVER END UP IS IN THE MOST DELIBERATIVE BODY IN THE WORLD THE US CONGRESS. Up next was Carlo De Masi who leads the most respected union in Italy, with a MEMBERSHIP of over 200 thousand. Brother De Masi talked about coming together. Carlo De Masi, Secretary General, Italian Federation of Electrical Utility Workers WE CAN BUILD AND COLLABORATE ON COMMON PROJECTS BUT ALSO PROVIDE FOR JOIN INVESTMENTS TO CREATE WORK FOR OUR MEMBERS THROUGH PENSION FUNDS. Carlo De Masi, Secretary General, Italian Federation of Electrical Utility Workers THE IMPORTANCE OF A CONFERENCE LIKE THIS ON CONSTRUCTION AND MAINTENANCE.CAN PROMOTE INVESTMENT THAT CAN CREATE JOBS FOR ELECTRICAL WORKERS. Bill Hite, General President of the United Association took some time to say he also came up with a code of excellence based on the IBEW’s and said training is important because we need to watch out. Bill Hite, General President, United Association I’M CONCERNED ABOUT FOREIGN WORKERS COMING IN HERE TO DO OUR WORK! AND EVERYBODY IN THIS ROOM SHOULD FEEL THE SAME WAY. WE LET GO MOST OF OUR MANUFACTURING NOW WE ARE OUTSOURCING A LOT OF OUR ENGINEERING AND THERE’S PEOPLE \ HERE IN THIS COUNTRY THAT WANT TO BRING IN FOREIGN WORKERS TO DO CONSTRUCTION WORK. SO WE WON’T BE ABLE TO ENGINEER ANYTHING. WE WONT BE ABLE TO MANUFACTURE ANYTHING AND WE WON’T BE ABLE TO BUILD ANYTHING. BROTHERS AND SISTERS WE NEED TO MAKE SURE THIS DOESN’T HAPPEN ON OUR WATCH! WE GOTTA STICK TOGETHER, WE CAN’T BE ONE UNION HERE AND ONE UNION THERE. ESPECIALLY THE BUILDING TRADES HAVE TO STICK TOGETHER WHEN IT COMES TO TRAINING AND CERTIFICATION, POLITICS. A highlight every year is the IBEW Hour Power Award winners for Apprentice, Journeyman and Instructor of the Year. Not only does it come with a free trip to Washington DC but each winner has their own moment in the sun and gets their own story told. Be sure to look for each of their stories on Hour Power very soon. The afternoon was then filled with great workshops… the Electrical Training Alliance talked about code and safety updates along with showing a new and improved learning model that will allow journeyman to be trained, decrease study time and reduce cost. Todd Stafford, Executive Director Electrical Training Alliance OUR MESSAGE IS THAT WE ARE SHOWING OUR BUSINESS MANAGERS AND TRAINING DIRECTORS THAT THERE IS A NEW METHOD OF DELIVERING CURRICULUM THAT WE NEED TO COME UP TO SPEED WITH ON HOW TO PRESENT IN THE CLASSROOM FOR MAXIMUM EFFECT. The Membership Development session was about OARS reloaded. OARS meaning the Organizing Accountability Reporting System. The new version has come out and has lots of great new features and developments. Greg Boyd, District Organizing Coordinator THE NEW OARS SYSTEM IS FASTER THAN THE OLD SYSTEM. IT’S MUCH MORE INTUITIVE. ITS EASY USED ON MULTIPLE DEVICES FROM A PC TO A LAPTOP, TO A TABLET, TO A PHONE, AND WHAT YOU SEE ON YOUR PC YOU CAN SEE ON YOUR PHONE. AND GIVES ORGANIZERS AN OPPORTUNITY TO BE OUT IN THE FIELD AND DO THE REPORTING AND PUT COMMENTS IN AND NOT HAVE TO GO BACK TO THE OFFICE. The Canadian Caucus was also a great session, as we all know our Canadian members extend over thousands of square miles. The opportunity to be in the same room to talk about issues of the great white north is so important. This year the focus was on politics. Bill Daniels, Vice President WHAT WE ARE TRYING TO DO IS MOTIVATE OUR PEOPLE TO INSURE TO GET THE MESSAGE OUT TO THE PEOPLE THEY REPRESENT AND THE IMPORTANCE OF GETTING OUT AND VOTING. …A lot going on here in Washington DC, as always, and now the job is to take that message and put it to work across North America.I must say, a lot of work goes into this meeting and the IBEW leadership is on a mission. That mission, “Don’t Settle for Survival.” Bingo! So with that…as always this is Matthew Walton for Erica McClaugherty saying so long from Washington, DC…and we will see you next time on HourPower.